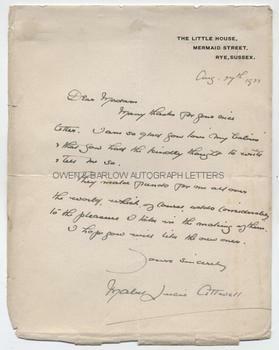 MABEL LUCIE ATTWELL AUTOGRAPH Letter Signed. English illustrator noted for her drawings of children. ALS. 1p. The Little House, Mermaid Street, Rye, Sussex. Aug. 27th 1922. To "Dear Madam"
"Many thanks for your nice letter. I am so glad that you love "My Babies" and that you had the kindly thought to write and tell me so. They make friends for me all over the world, which, of course, adds considerably to the pleasure I take in the making of them. I hope you will like the new ones." With good full signature. Large 8vo. Approx 9 x 7 inches. Some creasing and fraying to edges and with mounting traces to top edge of verso. VG. Mabel Lucie Attwell first based her drawings of children on her own daughter. These became hugely popular and appeared in books, on post-cards, posters, advertisements and ceramics. The reference she makes to her "babies" may not be a generic name for her drawings of children but may be referring specifically to her illustrations for 'The Water Babies' by Charles Kingsley, which she had illustrated in 1915. Around the same time she also illustrated J.M. Barrie's 'Peter Pan and Wendy' to great acclaim.